Last Monday I did something I never do: I responded to an Internet ad. It was one of those links to a video that promised information about a sure-fire way to get stronger and healthier and a better body in three months. I was feeling tubby, tired, and weak at the time so, in that idle moment, I pursued the link out of curiosity, even though I knew that I wouldn’t get any real information until I got to the paying part. And then when I got to the paying part I did something I really never do: I paid. I shelled out $40 to download the manual, calling myself a sucker but figuring it was $40 less harmfully spent than on eating out. (I did resist plonking down a monthly fee that promised more goodies.) 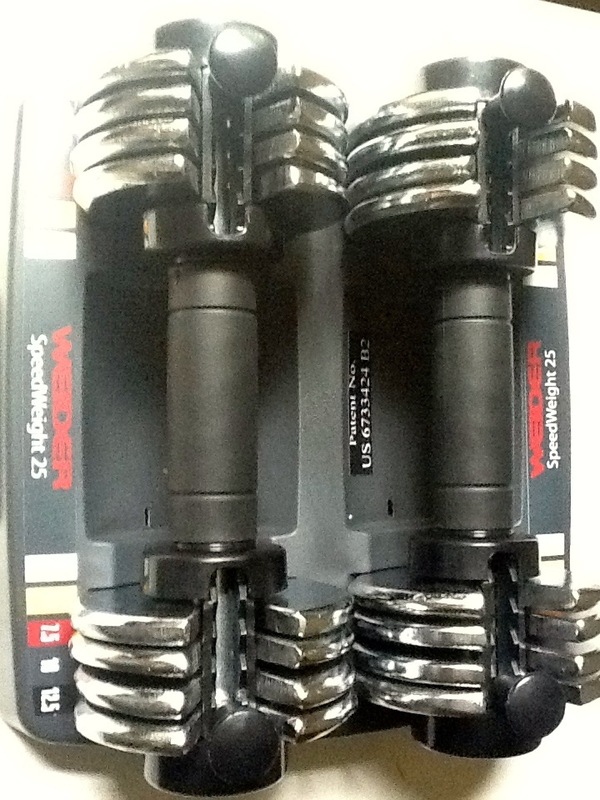 And then I went out and bought myself a set of weights, which was required by the program. Having spent that much money I figured I would actually have to do this. This program is so not me. It is based on intensity. I hate sweating and breathing hard. I have hated these things ever since school gym classes, which would leave me red-faced for an hour afterward. I would much rather exercise longer than harder. But the 3-mile walks didn’t seem to be doing much for my energy level. And my weight has been creeping up again. Also, I hate working with weights because it reminds me how weak I am in my upper body. That is why I bought the weights rather than trying to do this at the Y, where I have access to all the equipment I want at no cost. A 69-year-old woman flailing around with dumbbells and flopping arm flab is not a sight I want to inflict on anybody. (Though, I must admit, I’ve seen much worse at the Y.) I will do this in the privacy of my own bedroom. The appeal of the program is that it only takes 20 minutes. Just 20 minutes of torture a day. I figured I could manage that much for the sake of even a fraction of the benefits the program promised. Strength, higher energy levels, reduction of the persistent muffin top, and weight loss, because intensity supposedly increases metabolism for hours afterward. Also, I like to try something new every year and this would certainly be new. Full-body exercises with weights. Squats and pushups and jumps and intervals. Things I cannot do. Any learning would certainly be new and any progress would be measurable. The first week, indeed, revealed how much of a beginner I was. Although I am relatively fit from walking and yoga, I am starting at Level Zero on this stuff. Below zero, even. But hey. It’s nobody’s business but mine. No one is standing over me, yelling. And, indeed, it consists of pretty much sheer torture for 20 minutes every day. I huff and puff and sweat and get red in the face. But then it is over and I shower and feel really good, not much soreness after the first few days. The surprising thing is that the rewards are instant. I haven’t lost weight yet (the program comes with a low-carb, high-protein diet, which I am edging toward but not following strictly), and the flab will take time to disappear if, indeed, it does. But my energy level zoomed up beginning with Day Two. I am noticeably stronger after just a week. How I feel is more important than how I look, and I am feeling good. I’ll give this program the three months mapped out in the manual. That will take me to my 70th birthday.